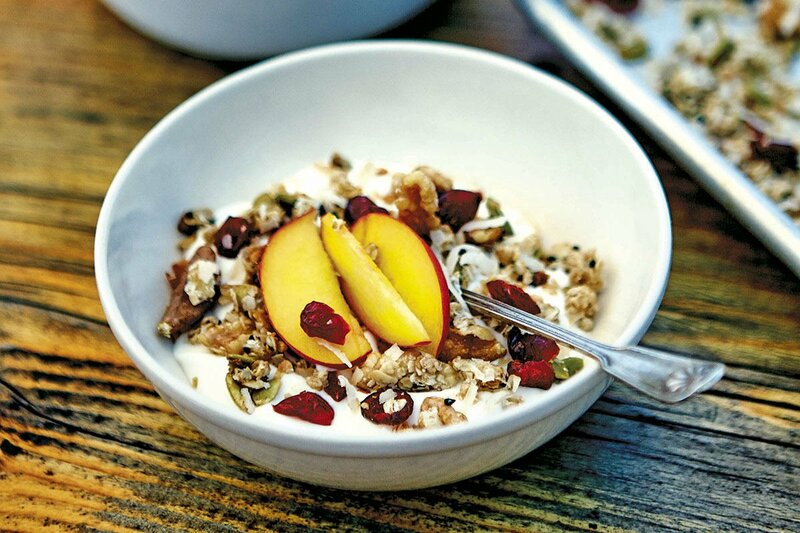 Coconut granola with yogurt and nectarine slices. Photo by Martin Lof. Helene Henderson, the Swedish-born owner and chef of Malibu Farm Pier Cafe, opened her farm-to-table restaurant when the dinners she served on her two-acre farm outgrew their intimate setting. The former pop-up cafe is now a permanent staple of the Malibu food scene. We asked her to share a recipe from her new Malibu Farm Cookbook: Recipes from the California Coast. MALIBU, California – We usually serve Malibu granola at the cafe. It's nicknamed "The Mayor's Granola" because Laura Rosenthal, who served as the mayor of Malibu, makes it. She won't share her super-secret recipe, but making your own version is easy. I prefer nuts and dried berries, but you can mix almost anything into it. The recipe is vegan and gluten-free. I usually eat my granola with unflavored kefir, but it's also great served with almond milk. 1. Combine oats, walnuts, pumpkin seeds, and sesame seeds in a medium-sized bowl. Toss with brown rice syrup and coconut oil. Season with salt. 2. Place on a baking sheet, and bake in a preheated 375 degree oven for 15 to 20 minutes, stirring occasionally, until the ingredients start to toast. 3. Add sweetened coconut and dried berries, and return to the oven for 5 more minutes. Transfer the granola to a plate and let it cool. It will crisp as it cools. 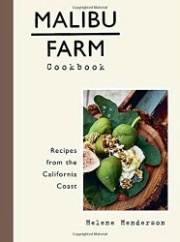 Buy Malibu Farm Cookbook: Recipes from the California Coast, by Helene Henderson. Reprinted with permission from Malibu Farm Cookbook: Recipes from the California Coast. Copyright © 2016 by Helene Henderson. Photographs copyright © 2016 by Martin Löf. Published by Clarkson Potter, an imprint of Penguin Random House, LLC. Helene is the owner and chef of Malibu Farm. Follow her on Facebook and Twitter.